I have a projector screen which weighs 26kg and I'm trying to fix it on to the wall. The screen has holes for two screws and I'm wondering what size screw I need to support that weight. To complicate matters - I live in an old Victorian townhouse and upon drilling in to the walls it seems that they are made of pebbles and big pieces of flint. I've drilled 3 holes in a vertical line, about 2 inch below each other and it seems like the pebbles fell through from top to bottom, so I've filled the top two with polyfilla and stuck a yellow rawplug in the bottom and am waiting for it all to dry. I have some 2 inch screws - is this a recipe for disaster? 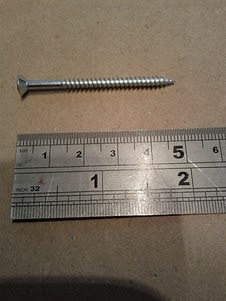 Below is one of the screws I have - I think I need bigger but can't make a hole big enough in the wall because of the flint all over the place. Is there anything else I can try? If you have doubts about the ability to solidly attache the screen with two screws into the wall, I'd consider putting up a 1x2 or 2x2 strip, then attaching the screen to that. You should be able to use a number of screws to attache the strip to the wall, and if you're not concerned about removing it you could even glue it. Then you can screw the screen to the strip, which should hold it without any problems. If you need a completely flat mount for the screen, you can build a frame out of the same material. Not the answer you're looking for? Browse other questions tagged walls screws or ask your own question.